Rodolfo Rivademar was born in Argentina in 1957. His childhood was steeped in an artistic environment that fostered his early development in drawing and painting. Maturing in this tradition, he gained his first “Best of Show” award at the age of 10 with a watercolor of the Cathedral of San isidro of Buenos Aires. Despite this early approbation in fine art, when of age he entered into a technical field. Architecture would prove to further enhance his artistic abilities, and through courses in drafting and sculpture with notable Argentine instructors such a Rivero Rodrigo, Carlos Terribili and Estela Pereda. Coming to the United States, he sought to further pursue this interest with studies in watercolor and oil painting under the tutelage of notable instructor Michael Daniel. To date Rodolfo Rivademar has taken part in over sixty exhibitions, including many one-man shows, and has been the recipient of several prestigious awards. His paintings form part of many collections both here and abroad, and have been reproduced in Southwest Art Magazine, American Art Review, Art and Antiques Magazine, as well as in numerous catalogs. His work has also been pictured in the Los Angeles Times, The Daily Breeze, Orange County Register, ArtTalk and many other publications. 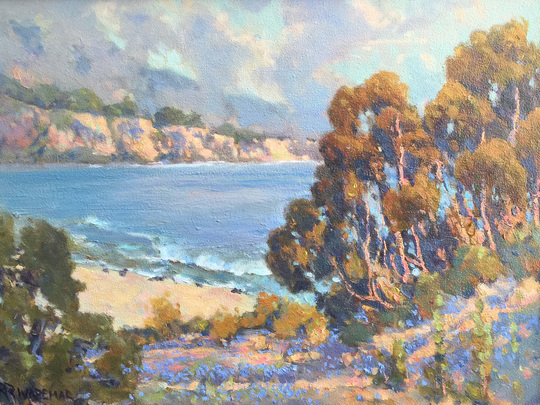 Rodolfo Rivademar is a charter artist member of the California Art Club. A rare pastels by famed Gold Medal CAC artist Rivadelmar. With over 60 exhibitions showing among fellow top artists and historical masters Rodolfo has earned his reputation as a great fine artist. Own a piece of his work at a great price. Drawings and pastels often show the true raw talent of the artist. 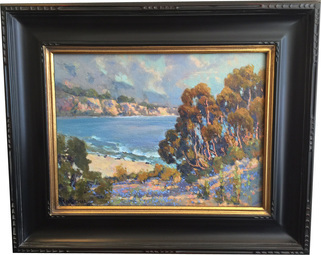 Rodolfo Rivadelmar Pastel 12x9" "Palos Verdes View", rare pastels by famed Gold Medal CAC artist Rivadelmar. With over 60 exhibitions showing among fellow top artists and historical masters Rodolfo has earned his reputation as a great fine artist. Own a piece of his work at a great price. Drawings and pastels often show the true raw talent of the artist. Unframed. This work is featured in our SHOP "click n buy" section as well. Rare pastels by famed Gold Medal CAC artist Rivadelmar. With over 60 exhibitions showing among fellow top artists and historical masters Rodolfo has earned his reputation as a great fine artist. Own a piece of his work at a great price. Drawings and pastels often show the true raw talent of the artist. Unframed.